Mr. Dean, we salute you: Wow. It's amazing when you're in the presence of greatness. 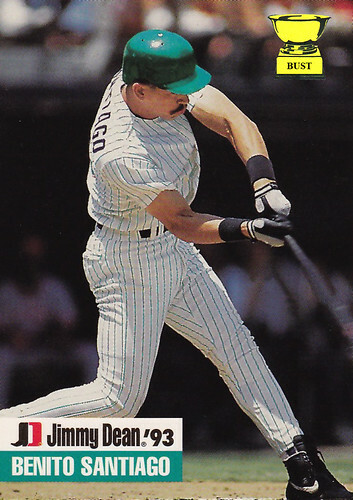 Not only does this impressive card feature the one-and-only Benito Santiago sporting a wraparound mustache, it features the JD cowboy boot logo, meaning it's another example of the sensational sausage spectacle that is the Jimmy Dean collection. First, we met a young, mustachioed Ken Griffey Jr., who liked his sausage like he liked his women: short, thick and brown. Then we were introduced to Frank Thomas, who had eaten so many succulent sausages that his body wouldn't even fit within the card's frame. Now, we get Benito, still no Major League Baseball logos, still no team, but, for the first time in the Jimmy Dean collection, a whole lot of teal. Dig in, America. This is one tasty Jimmy Dean set.